Advanced Absorbtion Liquid CoQ10 for Pets - Cyber Monday Deals! • The Only Enhanced Absorption Liposomal CoQ10 for Pets in the World! • Up to Eight Times Greater Absorption than Standard CoQ10! • Pet Friendly and Easy to Administer - Comes with Precision Dose Dropper! • 2700 mg of CoQ10 per bottle - Lasts Long! As a pet owner, you�ve probably struggled with devising new and innovative ways to trick your pet into taking a pill. I know I have. Our Liquid CoQ10 for Pets is a great way to administer high quality, enhanced absorption CoQ10 to your pet with the ease of a few drops! �I have a senior Chihuahua with significant heart problems that has definitely been coughing less since using this product. It's also easy to get into him since I can just put the drops onto his food. I would recommend it to anyone looking for additional support for their dog's heart health.� - Donna L.
�Needed a tasty liquid form of CoQ10 to add to my cat's food. 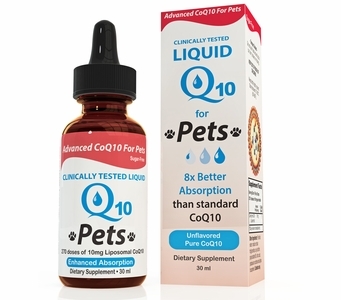 This filled the bill.� - Mary E.
There is simply no other CoQ10 on the market that can match the absorption rates of our Liquid CoQ10 for Pets and when it comes to CoQ10, absorption is everything. So rather than fighting your pet to get him or her to swallow a potentially inferior product, make it easy on both of you and try Liquid CoQ10 for Pets. The results will be as equally satisfying as the ease of placing a few drops in water and watching them lap it up! Directions: Add 25mg (approximately 10 drops) to a pets food or drink for small pets up to 15lbs, 50mg (approximately 20 drops) for pets 15 - 45lbs, 75mg (approximately 30 drops) for pets 40 - 80lbs, 100mg (approximately 40 drops) for pets 80lbs and up or as prescribed by your veterinarian. Note: Older pets may require increased dosage.